Last December, my sister bought a house…while 4 months pregnant. They redid a lot of the interior work to make it their home and 5 months later, my little nephew Blake was born. 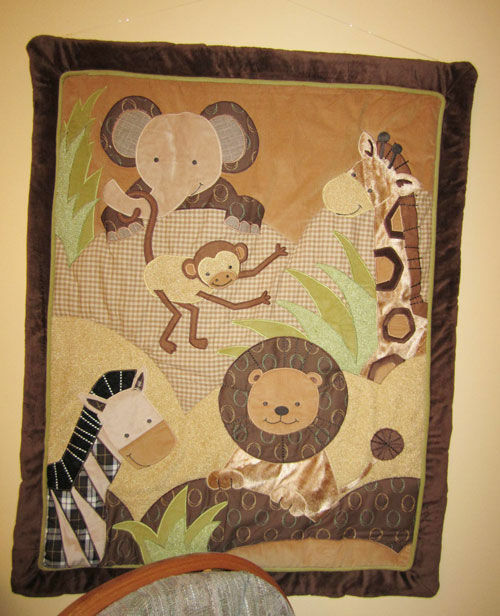 They set up a cute little nursery for him with a jungle animal theme. You know, the matching crib blankets, wall tapestry, hanging diaper bag, etc. But when babysitting in September, I still felt the walls were a little vacant for this fun little guy. Though I realize this gift is more for my sister than for him, for Christmas I painted 3 square panels of some of the characters for her to hang as extra wall decor in his jungle themed nursery. I went to Michaels with my coupon (and finance D, who was also manned with a coupon) and bought the canvas bases for my paintings. Here’s what I did! First, I drew out the designs slightly with a pencil. Tip: if you’re using something as inspiration, as I was, take a photo of this piece and print it out. Use a ruler to draw a grid over the picture. 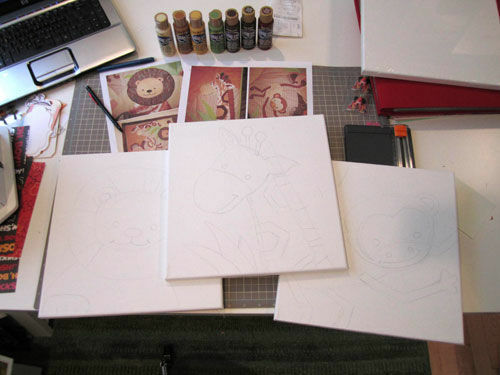 Use that grid to help you keep your drawing porportionate as you transpose it onto the canvas. 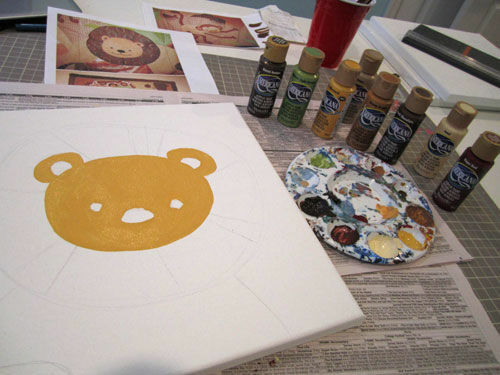 Next, I bought paints in the colors needed. I bought a few of the basics then also grabbed a white and black to mix. I recommend getting a small plastic paint palette that you can mix on. This one has seen a lot of loving over the years, but easily washes off for more painting adventures! Because his walls were yellow and the base behind each animal was also a light yellow, I decided to define my borders with a little bit of dashed line effect (which is also used in the original tapestry). Voila! 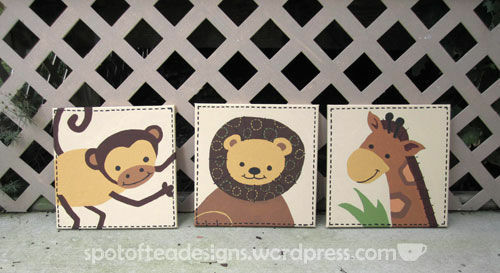 Three new jungle themed painting that match her existing decor to hang in his room. Brilliantly done…lucky little guy to have such a caring and talented aunt!